Excel already has a couple of ways to sort data quickly. You can easily sort a data set by using the sort icons in the ribbon or the sort dialog box. Then why do you need to know how to do this using VBA? Knowing how to sort data using VBA can be helpful when included as a part of your code. For example, suppose you get a data set daily/weekly that you need to format and sort in a specific order. You can create a macro to do all this for you with a single click. That will save you a lot of time and effort every time you do it. Also, if you create Excel dashboards, you can take Excel sorting capability to a new level by allowing the user to sort the data just by double-clicking on the header (as shown below). I will cover how to create this later in this tutorial. Let’s first quickly get the basics straight. When sorting using VBA, you need to use the Range.Sort method in your code. The ‘Range’ would be the data that you’re trying to sort. For example, if you’re sorting the data in A1:A10, then ‘Range’ would be Range(“A1:A10”). While these three suffices in most of the cases, you can read more about the parameters in this article. Now let’s see how to use the Range.Sort method in VBA to sort data in Excel. Suppose you have a single column without header (as shown below). You can use the below code to sort it in ascending order. Note that I have specified the data range manually as Range(“A1:A12”). In case there might be changes in the data and values might be added/deleted, you can use the below code that automatically adjusts based on the filled cells in the dataset. Note that instead of Range(“A1:A12”), I have used, Range(“A1”, Range(“A1”).End(xlDown)). This will check the last consecutively filled cell in the column and include it in sorting. In case there are blanks, it will only consider data till the first blank cell. You can also create a named range and use that named range instead of the cell references. For example, if the named range is DataSet, your code would now be as shown below. Key1:=Range(“A1”) – Specified A1 so that the code would know which column to sort. Order1:=xlAscending – Specified the order as xlAscending. If you want it to be in the descending order, use xlDescending. Header:= xlNo – Specified that there are no headers. This is also the default value. So even if you omit this, your data will be sorted considering it has no headers. Wondering where to put this VBA code and how to run the macro? Read this tutorial! In the previous example, the data set did not have a header. When your data has headers, you need to specify that in the code so that the sorting can start from the second row of the dataset. Below is the code that will sort the data in descending order based on the sales of the stores. Note that I have created a named range – ‘DataRange’, and used this named range in the code. So far in this tutorial, we have seen how to sort a single column (with and without headers). Now, what if you want to sort based on multiple columns. 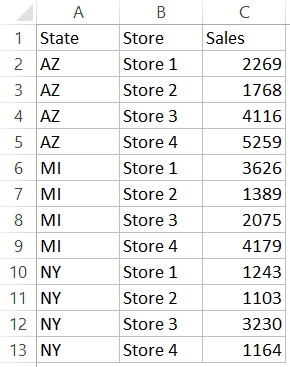 For example, in the below data set, what if I want to first sort by the state code, and then by the store. Here is the code that will sort multiple columns at one go. Below is the result that you will get. In the above example, the data is first sorted by the state code (column A). 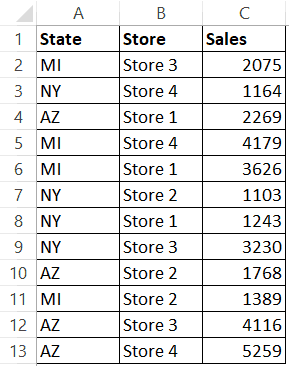 Then within the state code data, it is again sorted by the Store (Column B). This order is determined by the code in which you mention it. If you’re creating a dashboard or want more ease of use in your reports, you can write a VBA code that will sort the data when you double click on the headers. Note that I have created a named range (“DataRange”) and have used it in the code instead of using the cell references. As soon as you double-click on any of the headers, the code disables the usual double-click functionality (which is to get into the edit mode) and uses that cell as the key while sorting the data. Also note that as of now, this code will sort all the columns in an ascending order only. 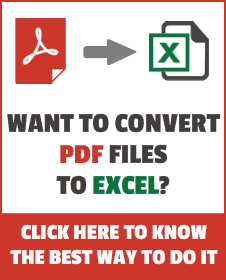 Note that double-click is a trigger allows Excel to run the specified code. These triggers such as double-click, opening a workbook, adding a new worksheet, changing a cell, etc. are called events and can be used to run macros in Excel. You can read more about Excel VBA events here. You need to paste this code into the code window of the sheet in which you want this double click sort functionality. Paste the code in the code window of the sheet in which your data resides. Now what if you want to sort the first two columns (‘State’ and ‘Store’) in ascending order, but ‘Sales’ column in descending order. 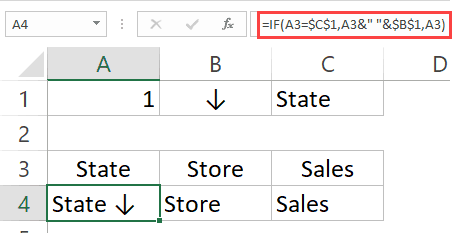 In the above code, it checks if the cell that is double-clicked is the Sales header or not. If yes, then it assigns the xlDescending value to the variable SortOrder, else it makes it xlAscending. Now let’s take this a notch further and show a visual Marker (arrow and colored cell) in the header when it is sorted. Changed the name of the new sheet to ‘BackEnd’. In cell B2, entered an arrow symbol (to do this, go to Insert and click on ‘Symbol’ option). Copy and paste the headers from the data set to cell A3:C3 in the ‘Backend’ sheet. Rest of the cells will automatically get filled by the VBA code when you double click on the headers to sort the column. Now you can use the below code to sort the data by double-clicking on the headers. When you double-click on a header, it will automatically get the arrow in the header text. Note that I have also used conditional formatting to highlight the cell as well. Note that this code works well for the way my data and workbook is constructed. If you change the structure of the data, you will have to modify the code accordingly. How to do a Multi-level Data Sorting in Excel. 24 Useful Excel Macro Examples for VBA Beginners. this isn’t working for 4 columns. It sorts my data for the first 2 columns I specify, but not after that. I could not download the example files. Interesting. Is there an approach that would allow sorting as described here but a) contents of cells to be protected. b) some visible data columns to be excluded as sorting by options? i.e. double clicking on some headers does nothing because we don’t want the user to break the data set, but they do need to be able to see it. Thanks. How to sort excel data on basis of Color of cell? very helpful. Thank you. I had found some older macro code with “key1:” but that doesn’t appear to work anymore so it was helpful to see “add key” in your code. My profile is RTA in a bpo and I need your help. Hope you don’t mind. Question – We do have Forecast volume from client and actual volume is refreshed every 5 second and is updated in excel. Based on that I can judge in which span the number of calls / chats were high/low. High volume observed in Business, Sales Skills. I have used the formulas which will filter both of the values (greater than 10% as high volume and less than -10% as low volume. I need to send an e-mail which will filter and write automatically as mentioned above.